The Sunbeam Talbot sports car. Alderman John Marston, JP was a keen cyclist, and his company built the first Sunbeam bicycle in 1887. They were the finest that money could buy, and a prominent owner was the composer Sir Edward Elgar. In 1899, he ventured into car production and, by 1911, Sunbeam was building 650 cars per year. In 1922, at the Brooklands race track, a 350 bhp, V12 Sunbeam sports car established the first World Land Speed Record of 133.75 mph. In 1924, Malcolm Campbell made changes to the car, and named it Bluebird. A year later, Bluebird reached a new record of 150.87 mph. By this time, Sunbeam was a household name. Ultimately, Sunbeam became part of the Rootes Group, and the post WW2 Sunbeam-Talbots were launched in 1948. Two Sunbeam-Talbot models, the 80 and 90, were launched in July 1948. They were offered as either a saloon or drop head coupe version. The 80 used an 1185 cc, 4-cylinder, side valve engine, developing 47 bhp at 4800 rpm. On the other hand, the 90 had a 1944 cc, 4-cylinder, side valve engine, developing 64 bhp at 4100 rpm. The chassis was based on that used in the 2 litre saloon car, while the brakes were updated to be hydraulically operated. Designated the Mark 1 sports car, the 80 was phased out in 1950 after 3,500 units had been built, together with 4,000 units of the 90. That same year, the Mark 2 sports car was introduced, but only as the 90, and again offering the same two versions. It featured a new chassis, independent front suspension using coil springs, and an engine whose capacity was increased to 2267 cc, and developed 70 bhp at 4000 rpm. The increase in power was achieved by using a different cylinder head, which incorporated overhead valves, since the original head, from the Humber Hawk saloon, still retained the side valve arrangement. The front of the Mark 2 was modified with the headlights and mudguards being raised, the former by three inches, in order to comply with US lighting regulations. There were also small air intake grilles on either side of the radiator, which were in place of the two lamps on the Mark 1. A total of 5,493 of the Mark 2's were built. In 1952, the Mark 2A sports car was introduced, and was recognised by the fact that the rear wheel spats had been removed. It used the same engine as the Mark 2 but, as a result of the compression ratio being increased, it now developed 77 bhp at 4100 rpm. Furthermore, the brakes were enlarged, and to ensure they were adequately cooled, the wheels were pierced. 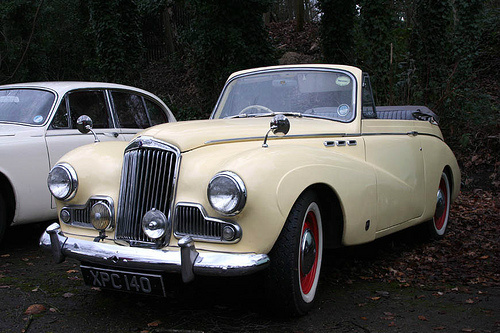 The Mark 2A drop head coupe was by far the rarest of all the Sunbeam-Talbots produced. A total of 10,888 Mark 2A units were built. 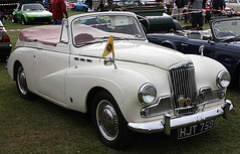 In 1954, the Mark 3 was introduced as the Sunbeam Mark 3, the Talbot name having been dropped. Above the radiator, it received a badge denoting the name Sunbeam Supreme. Initially, it was offered as the two variants of the previous model. However, after 1955, the drop head coupe version was discontinued. There were minor changes to the body styling, this time with larger air intakes on both sides of the radiator grille, together with three small portholes just below where the bonnet met the windscreen. Also, a two tone paint system was now available. The engine now received the same specification as the later Alpine model, and therefore developed 80 bhp. An overdrive unit was now offered as an optional extra. Some of the earlier Mark 1 and 2 cars were exported displaying Sunbeam badges in place of the name Sunbeam-Talbot. Allowed the boot lid to open in a different way. Nearly forty cars were modified in this way, and came to be known as the Mark 3S. The Sunbeam factory played no part in these modifications. The revised gear change arrangement, suitable on earlier models as well, was available post production. By the time the Mark 3 sports car was phased out in 1957, some 2,250 units were built.